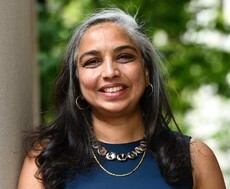 Anita Shankar, PhD, is a medical anthropologist with more than 25 years of research and field experience targeted at improving women’s empowerment as well as maternal and child health. Her research focuses on investigating and testing innovative cognitive-behavioral interventions directed at fostering personal agency as a means of catalyzing positive behavior change. Her research focuses along three intersecting lines of research (1) understanding factors impacting the expanded distribution and use of clean energy technologies in resource poor settings; (2) examining the role of women, as entrepreneurs and primary household energy managers, as essential levers for improved health through effective engagement along clean energy value chains and (3) laying the scientific foundation and tools for personal agency-based empowerment interventions to increase human adaptability, secure livelihoods and improve health. Dr. Shankar is a lead author on the Empowered Entrepreneur training handbook and has led a global training of trainers’ program to scale this initiative to clean energy organizations worldwide. She is Principal Investigator for an ongoing randomized controlled trial in Rwandan refugee camps to assess the impacts of clean cookstove technologies and a couples’ based personal agency intervention on decreasing the risk of both non-partner and intimate-partner violence in humanitarian settings. Shankar A, Sundar S, Smith G. Agency-Based Empowerment Interventions: Efforts to Enhance Decision-Making and Action in Health and Development. Journal of Behavioral Health Services & Research 2018 Feb 23. doi: 10.1007/s11414-018-9592-0. Shankar, AV, Onyura, M and Alderman, J. Agency-based empowerment training enhances sales capacity of female cookstove entrepreneurs in Kenya. Journal of Health Communications 2015; 20 Suppl 1:67-75. Shankar AV, Asrilla Z, Kadha JK, Sebayang S, Apriatni M, Sulastri A, Sunarsih E, Shankar AH on behalf of the SUMMIT Study Group. Food Nut Bull. 2009;30(2). S207-S214. Programmatic effects of a large-scale multiple-micronutrient supplementation trial in Indonesia: Using community facilitators as intermediaries for behavior change.